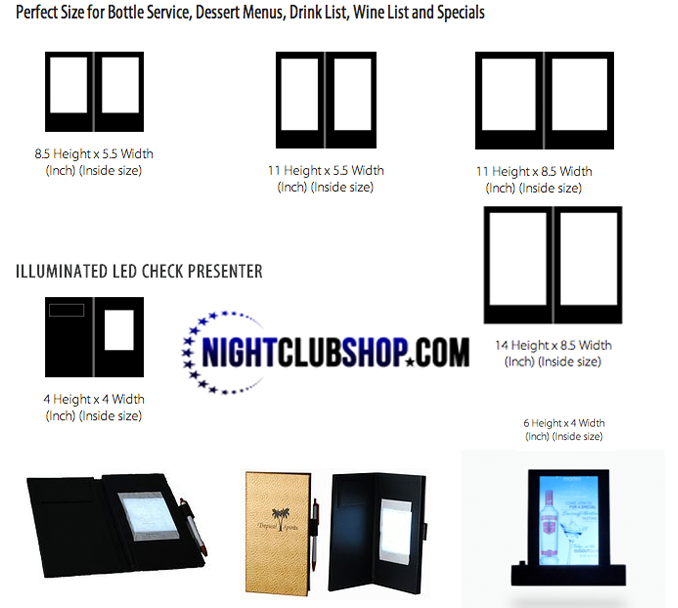 NightclubShop is proud to offer the world's first ever rechargeable 11"x5.5" inch LED back lit menu. The 11"x5.5" inch LED MENUS features 4 (four) different sizes. All of the sizes are measured by the insert size. The Larger Menu of its Kind, 11" inches in height, and 5.5" inches in width. Utilizing LED technology, these menus illuminate and light up when opened, and automatically turn off when closed, to help conserve and save battery life. Great for bars, restaurants, nightclubs, Vip's, and lounges. The material is made from black solid pleather. These LED MENUS actually Glow, Light up and illuminate well enough to see the menu items in completely dark area or Restaurant/Venue. They use transparency printed inserts and can be changed upon need, also last from 8-10 Hours before needing to be recharged. We carry the newer type models with Micro-USB single charge interface plug instead of the older models that had 2 different plug interfaces, one on each side. These menu's are fully rechargeable and can be customized for an extra charge with Silk Screening, Embossed or De-bossed Lettering. If you are interested in customizing your Menu order, please call us for more details.